Spring is by far my favorite season. The long, cold winter is finally over and new life is all around! Perhaps it is because I grew up in Florida, home to an ominous single season consisting of 80 degree temperatures and 100% humidity all year round, but for me the changing of seasons is an amazing and beautiful phenomenon that always reminds me why I love studying the natural world. From a biologist's perspective, spring is a perfect time of year to study and appreciate new life, and a sort of re-birth of species that remained dormant all winter. What a wonderful adaptation of deciduous trees and other winter-sheltering plants and animals: why battle the harsh winter like us humans, when you can simply go to sleep and skip all that cold and hassle?! If you ask me, the trees have got the right idea. While it is less obvious at first glance, most coastal marine organisms in temperate climates know what's up and go dormant for the winter as well. To deal with the lack of light and intense cold, seaweeds practically pause their growth completely, and with their food source dormant, most herbivores and secondary consumers limit their activity as well. Go tidepooling in the winter (as I often did for my environmental monitoring research) and you'd be hard pressed to see any activity. All the snails, crabs and sea stars hunker down in the rock crevices until spring brings the light, nutrients and warmth that these organisms need to ramp up their growth again. So just like the terrestrial organisms, coastal marine species are experiencing an incredible pulse of growth, birth and re-birth right about now as well, in the form of seaweed and phytoplankton blooms, gravid crabs ready to shake tiny baby crabs from their abdomens, and nearly microscopic mussels and barnacles settling on the rocks. From rocky shores, to woodland clearings, signs of spring are all around! As a celebration of spring, I've photo-documented spring flowers in various locations from my back yard, to the back bay! Enjoy these photos, and to go on a spring flower tour of your own, check out this websites that maps out all the flowering trees in Cambridge. Happy Spring! I'll take the scorpion cocktail, please! If you like a juicy burger or perfectly seared steak as much as the next guy, but have qualms about animal welfare or environmental impact of livestock production, then keep reading. With the world's population reaching carrying capacity, and a global food shortage looming, alternative nutritional options must be considered. And what could be a better candidate than the most abundant organisms on the planet: insects. Insects, animals that walk on 6 legs, make up 80% of organisms in the Kingdom Animalia. There are an estimated 5 million insect species (compared to about 5,000 mammal species), and while insects are small, their total biomass is equal to more than twice all other animals. But it's not just their abundance that makes them a valid menu option. They also are high in protein, iron (insects contain more iron than beef!) and other essential nutrients and minerals that we all strive to include in our diets. For the animal rights activists out there: it has been argued that insects do not have the neural capabilities to feel pain, so we don't need to feel as guilty about eating them. And my favorite reason to eat insects is how environmentally friendly it is! Raising insects takes 20x less energy than raising livestock, AND there is no time/energy spent processing insects, because we can eat the entire insect. And of course, insect farms aren't pumping toxic methane gas into our atmosphere, like some of our other favorite protein sources. Also, Insect farming uses only a tiny fraction of water compared to traditional farming methods. So considering insects as a food option seems like it could help us work on a couple of the world's big problems: food supply, water supply, carbon emissions, the list goes on. Why, then, aren't more people eating insects? In fact, 80% of the world's population does eat insects. Many cultures even consider them a delicacy. Its just us squeamish Americans and Europeans that are putting a kink in the insect food revolution. And what's funny is that despite all our squeamishness, we are probably already eating insects, since the FDA's regulations allow a certain percentage of insect parts in some foods. So what are we waiting for? I think changing people's perspectives -eliminating the "Gross!" factor - is key. But how? Some folks have already started doing this by incorporating insects into everyday foods. A great NY Times piece offers some suggestions. Just roast up some wax moth larvae and throw it into your trail mix, or replace half of the chocolate chips in your cookies with crickets for some delicious "chocolate chirp cookies"! If you look at it from a scientific perspective, how is eating an insect any different than eating a lobster or a shrimp? They belong to the same group of animals, known as Arthropods and have many of the same characteristics such as many legs, an exoskeleton and antennae. With that information in mind, maybe an adventurous few might think twice before turning down some tasty scorpion in place of shrimp with their cocktail sauce. One thing I want to try: seasoning my food while its still alive. No joke: if you feed your insects cilantro then they will taste like it! Get ready for some delicious cricket tacos! Luckily it looks like the insect food revolution won't have to be something we take on alone, in our own kitchen. A variety of food vendors seem to be experimenting with bug gastronomy, including local Boston start-up Six Foods, whose motto is "six legs are better than four". Look for their snack foods, such as cricket chips, better known as "chirps"
As someone who loves to eat, but thinks a lot about how my food choices are impacting the environment and my own health, I am definitely ready for the insect food revolution. I think the trick is to start small, because to be honest, I am as creeped out as the next guy by the thought of a cockroach on my plate. However, eating some chocolate chirp cookies is definitely something I hope to try soon! And how better to celebrate than with the most traditional of Irish dishes...lasagna!! An article showcasing some of my master's research was just published in the journal Oecologia. After countless hours of work, editing, re-editing, slightly tweaking figures millions of times in powerpoint and then saving them as PDFs, its hard to put into words how ecstatic I am! As I reflected on my scientific journey to this point, I remembered an undergrad version of myself reading the seemingly cryptic scientific papers that her professors assigned. This younger version of me certainly never imagined that she would author one of those intricate scientific studies. And a mere 4 years later, here I am. Oh the wonders of graduate school - revolutionizing one's skill set from an overwhelmed undergrad to a published scientific writer! Of course I owe an incredible debt of gratitude to co-author and amazing advisor Matt Bracken, without whom I might not have gone to graduate school in the first place! Check out my article here! And spread the word, because what's the worth of science that's not shared?! If you've met me or read my blog posts you probably know that I am a reduce/reuse/recycle enthusiast with a passion for raising awareness about marine debris. What is marine debris? It's the term for any trash that makes its way into the ocean - which it turns out is a lot more trash than you think. When I am teaching children about the ocean, we do a simple activity with pictures of sea creatures swimming happily in the ocean and then we dump some trash on them and ask kids how they think that trash got there and how they think it impacts the animals. The idea is to get them to see that even if you throw trash on the ground far from the ocean, it could make it's way to the ocean via a storm drain, the wind etc. Another sad fact, that we don't quite get into with kids, is that humans produce too much trash to fit in landfills. With nowhere to go, trash is going to inevitably end up in nature. This post is getting a little too doom and gloom so lets stop dwelling on the problem and talk about the solution. What can we do? The first thing that comes to mind is: lets get that trash out of our ocean. Grab a trash bag next time you go to the beach as a simple way to work towards preserving these recreational spaces we all enjoy. Even better though, how about trying to keep the trash from getting there in first place? Of course we have all heard of the three R's: Reduce, Reuse, Recycle. These are great, although most people rely too much on the third, and don't really know how to execute the other two. One of my favorite ways to "reduce" is to alway ask myself when thinking of buying or using something: "Do I need this plastic bag, straw, plastic water bottle, etc". The answer is usually no, I can use a reusable bag, drink without a straw or use a reusable water bottle. Similarly whenever I am about to throw something away I ask myself, how could I reuse this? For example, repurposing a pickle jar into a drinking glass or a yogurt container into a tupperware. However, my favorite reuse method is Marine Debris Art which has been growing in popularity with examples popping up all over the country. One particularly stunning piece of Marine Debris Art that caught my eye the other day was this sea turtle, created by senior's at St. Rose High School in New Jersey. What an aesthetically pleasing use of marine debris!! Crafty students worked hard on this trashy turtle for their senior project; he is even eating a pink "jellyfish", talk about attention to detail! 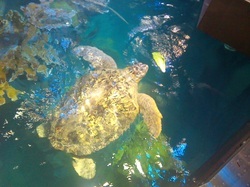 Yesterday I visited the New England Aquarium to celebrate my friend Laura's birthday. As someone who studies marine biology, sometimes I think that going to the aquarium might be a bit redundant. And then I get there and see Myrtle the 80 year old, 500 pound green sea turtle and realize how wrong I was in my thinking. We saw a great IMAX movie called Journey to the South Pacific. Similar to other nature documentaries about this region, the scenery was amazing, and instantly reminded me of my long-time desire to visit these remote and untouched islands. This film though, provided a unique look into the life of inhabitants of these islands, and how it is changing as they realize the need to care for the extremely lush and diverse ocean ecosystem on which they depend for their livelihood. The young main character gets a trip on a special boat, that travels between islands educating the inhabitants of the values of preserving the reefs, and how ecotourism can provide a more reliable livelihood than an overfished reef. Definitely an overall feel good movie that reflects on the dichotomy between traditional island life and our changing planet, and makes me want to join the crew of that education boat! Exploring the aquarium after the IMAX we ended up at the top of the GOT (Giant Ocean Tank). As if the turtles, rays and needlefish weren't excitement enough, they were trying out some new technology that allowed the interpreters to communicate with the SCUBA diver in the GOT! Having never heard of this technology, I was skeptical at first, but then as the diver surfaced, I could see some fancy waterproof audio equipment near his regulator, and figured it must be legit. I was certainly impressed as the audience asked tough questions of the diver like "Does the puffer fish ever puff up?" To which the diver expertly answered "Not usually because that would mean it was stressed, and we don't like to stress out the fish." Good answer, no one should be stressed at the aquarium. So, if you are a marine biologist (or anyone else!) wondering if a trip to the aquarium is worth your time, don't think twice! Especially if it is for a birthday celebration. Happy Birthday Laura! I am a marine science researcher, educator and SCUBA diver with a passion for science communication. After getting into blogging as a graduate student, I am ready to dive into the deep blue waters of my own blog!